After 30-plus engaging albums in styles ranging from XTC-styled pop to straightforward jazz, Django-influenced guitarist Reynold Philipsek shows no signs of slowing down, despite being virtually unknown outside of Minnesota. Reynold plays Hot-Club-of-France-styled music every week to enthusiastic audiences. Philipsek most recently put out "East Side," an album of conventional jazz featuring local chromatic harmonica wizard Clint Hoover. 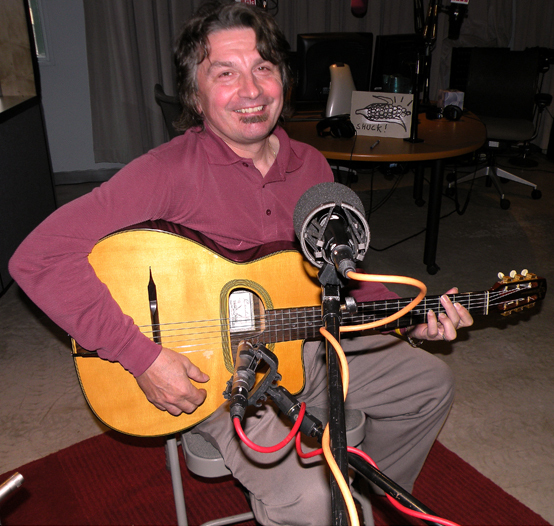 Reynold Philipsek sat down in the studio with Irene to record a set of solo guitar on a recent visit to New York. 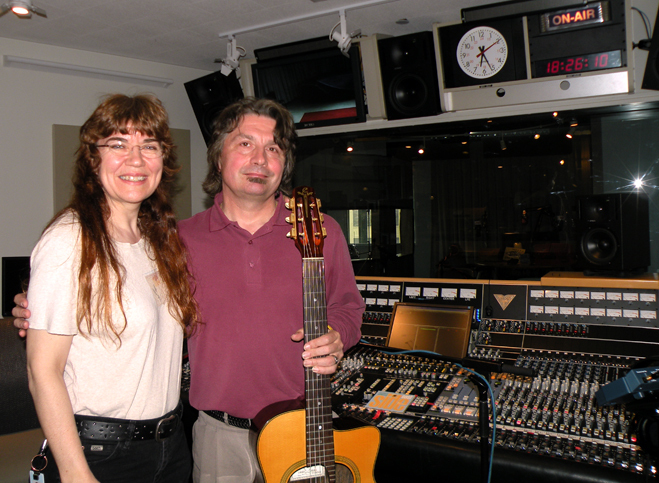 Irene with Reynold Philipsek in the studio after the session. present and accounted for, for the moment..
Is this Ralph Towner/Gary Peacock piece the theme music for Acousmatic Theater Hour? Hi Irene. Hi everyone. Are you playing the gypsy jazz guitar today? Tour dates for Justin Adams and Juldeh Camara if anyone's curious - http://www.realworldrecords.com/tours/artist/justin-adams - these guys kick tuchus on cd, I can't wait to see them live! Looks like you answered my question musically. i love the clapping noise. or feet-ing noise.. Thanks Rob & everybody! Yes, we're a little in a gypsy jazz-y mood (at least I am). Nice to have you all listening! Just a wonderful selection of music, the Brian Blade track was just sublime, have just ordered it on Amazon! Perfect, as I'm a yuuuuge fan. Especially of this here guitarist. If you have time for any Angelo DeBarre or Bireli Legrene, that would be the icing on the cake. Hey Carmichael! I don't know either of those artists. Time to go searching! I think you'll enjoy them, if you like Mr. Philipsek. Always happy to check out a listener suggestion. Often your tastes can rival ours. Thanks Carmichael! Sheesh. Two hours? That's just not right. Thanks. You'll have to take it up with management. Two hours is not my choice.